The Real Madrid captain has been benched for the second time for today’s La Liga fixture with Real Sociedad. REAL MADRID CAPTAIN Iker Casillas has once again been left out of the starting lineup against Real Sociedad by under-fire coach Jose Mourinho whose side trail leaders Barcelona by 16 points. Casillas, one of the figureheads for Madrid and the Spain national side, was also on the bench for the final game before Christmas against Malaga which ended in defeat, and the decision to omit him a second time, with Adan Garrido taking his place, will fuel incredulity at the Bernabeu. Madrid have made a stuttering start to the season and rumours have grown of a rift within the dressing room between Mourinho and some of the heavyweights such as Casillas and Sergio Ramos. After just six minutes, however, Adan was red carded after giving away a penalty and Casillas was introduced from the bench. He was unable to save the spot-kick and it is currently 1-1 after Karim Benzema’s second minute opener. Email “Out of favour: Mourinho drops Casillas yet again”. 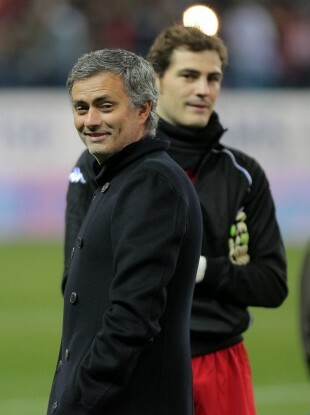 Feedback on “Out of favour: Mourinho drops Casillas yet again”.